The 4-star hotel Mom'Art Hotel, nestled in the heart of a district steeped in history, a few steps from the Sacre-Coeur Basilica, offers 24 rooms and 1 suite spread around a patio. Each room has been individually designed, and each one features a unique decoration and accessories, as well as bespoke furniture. With its bar, its terrace in the paved courtyard, its fitness area with spa, and its restaurant, the Mom'Art is the perfect place for a memorable and relaxing stay. The Mom' Art & Spa offers 24 rooms and 1 suite with a unique decoration, with specially designed accessoires and furniture. The rooms are characterized by the use of beautiful materials and refined elegance. All rooms are equipped with high quality bedding, Hypsom mattress toppers and throw blankets from Missioni Home. They also feature a private bathroom with shower, toilet, hairdryer, bathrobe, slippers and welcome products, free Wifi, air-conditioning, a minibar, a safety deposit box, a TV, a Marshall speaker and a Nespresso coffee or tea machine. All rooms are non-smoking. - The restaurant located in the inner courtyard (covered and heated during winter time) welcomes you from 11:30 am to 10:00 pm. - The Bar & Lounge is open from 6 pm to 11 pm (Monday to Sunday). Artistic and refined setting. - Spa & Fitness : In the basement you will find a relaxation area with a spa, and equipped with a sauna, a treatment room and a gym. 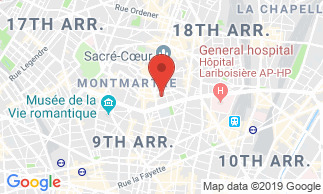 The Mom'Art Hotel & Spa is ideally located in the heart of the Montmartre district, at the foot of the Sacre-Coeur Basilica, in the immediate vicinity ot the Montmartre funicular, and the 'Anvers' metro station (line 2). Nearby, you will find many bars, restaurants, museums, theatres and concert halls. The continental breakfast is not included in the room rate: 10 EUR per person. It is served in the breakfast room from 7 am - 10:30 am.